Drake, the child star-turned-hashtag-rapper who would have you believe that his last name is Ever and his first name is Greatest, has been sitting courtside at a lot of Miami Heat games this postseason. This is partly because he is rich and lives in Miami, and thus needs to be photographed doing rich-guy things in Miami, but it is also because Drake and LeBron James have one of those special because-we're-really-rich friendship bonds. They are, according to James, like "a real family." Which tells us a lot about LeBron James. Marc J. Spears somehow found 700 words to say on the matter today; he led off with a text message that Drake sent to James before the game: "Tonight is your night." There were no smiley faces. No long text message. No picture. Rather, Grammy-nominated rapper Drake sent his usual encouragement, via BlackBerry Messenger, on game day to his close friend, LeBron James. It simply read: "Tonight is your night." I always let him know that it's his night. Let's get it, let's go out there with a clear mind and forget all the other stuff going on and just stay focused on the task. That ring. Tonight, I told him it was his night. And it was his night tonight. James, we've learned, has been a Drake fan since "long before" his first studio album, Thank Me Later (it should be noted that Spears does not grant Toronto-born Drake the same credit for his affinity for the Heat), and in a perfect storm of terrible ideas, a Drake character even appeared in an episode of The LeBrons. This friendship is telling. Actually, this friendship is beyond telling. No other sprawling profile needs to be written about LeBron James. This is his soul laid bare. 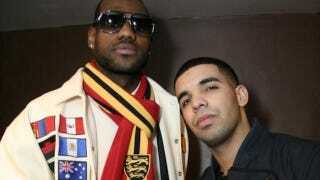 All you really need to know about LeBron, from now on, is that he enjoys Drake's music and that they are friends. Drake makes pop music about buying things for women and pouring liquor for his boys; he has never told a story or confessed a thing in verse because there is nothing for him to tell. We know this because when he is forced to say things without his BlackBerry, all he is capable of emitting is the phrase "I say," a lot of "uhs," and some frantic hand-waving. He is bad in a completely banal way (after all, he is a Miami Heat fan). He is bad in the way that bad shampoo commercials are bad. He is bad in a way that makes it hardly worth the effort to even say he's bad. He says what is expected of him, and does what he is told, even though no one asks him to. And of course, he made this and can still sleep at night. "It's something about being out there," Drake told Spears about sitting courtside. "I get out of my seat and kneel on the court as if I'm about to get in the game. We're playing on a similar wave length." He's right. In a way, LeBron is basketball's Drake. He's the guy you want desperately to hate because he's committed some faint version of selling-out, and the guy that you can't quite hate because it is so frustratingly hard to say why you hate him. But now, we have something tangible to bring to the debate: "He's friends with Drake."